Called 'trading cards', the idea of even 'trading' one of the 1992 Marvel Masterpieces, done in iconic fashion by painter Joe Jusko, bordered (and still does border) on sacrilegious. It may be almost 20 years ago now, but in '92 Joe gave the 'House of Ideas' it's finest coat of paint. As an aspiring artist at the time, Jusko's cards were a HUGE influence on me. I would redraw them constantly, trying to nail the awesomeness involved in each - jeez, looking back I must've rendered Psylocke alone a good thirty times. Never succeeding, but I can tell you I have never drawn a sword differently since. Spider-Man Face it; if you're doing anything 'Marvel' and screw-up Spidey you may as well stop. Here Joe made an icon iconic, and that's from a guy who ain't a fan of the big-eyed look! Nightcrawler Nothing beats my favourite X-Man in his classic duds. Here the 'Bamf!' is so detailed, Kurt's simple suit 'pops' even more. Darkhawk No one draws ol' DH as good as artist Mike Manley, however, this is as close to second as you can get - and it's done in paint! Namorita MM '92 really gave the New Warriors a decent slice of pie. I loved the way this card was left half 'empty' as Nita sizes you up. 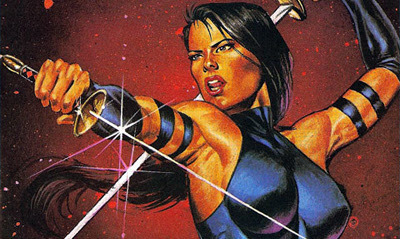 Psylocke Yip, my thing for Psylocke officially started right here. Black Cat No imitation Catwoman, here Joe gets Felicia bang on. Adam Warlock I never cared for Adam until I saw this card. His cosmic anger made me go look into him more. Storm Does the best x-leader ever take a bad picture? Calm face - wild weather - pure Storm. Captain America Predictable? 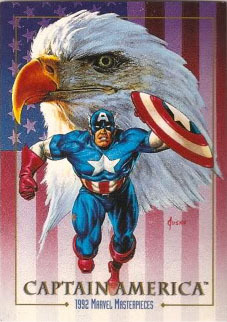 Maybe, but there's no denying the simple idea of Cap running towards you while a bald eagle rears it's head against the stars and stripes, pulled off as well as Joe does here, can ever finish in any place other than #1. Which ones from the set do you remember? There. I planted an idea in your head. Consider it payback for the X-Factor thing. I loved quite a bit of the art in these series. From what you've posted in the past, the Psylocke and the Gambit with glowing pink cards flying out in an arc were the two that made the biggest impression on me. On the DC side, I'd have to say the Poison Ivy card is the one of choice. I have a set of those cards in storage somewhere. That Captain America one has got to be my favorite. AWESOME! for a while there i was collecting these Jusko cards of all the hot women in Marvel. i had all the ones among others featured in this posting but i think psylock remained my favorite. This really was one of the best cards sets to come out of the 90s. Back then I wasn't collecting too many Marvel titles, but even I was wowed by this art. Really impressive stuff! You guys are WAY too kind! I'm astonished at how popular this set still is, especially because of the extremely limited time frame I had to produce it! I sign more of these cards at shows than anything else I've ever done! Thanks for the shout-out, Dan! Joe, holy crap it's really you? Leave it to Dan bring in the big guns. This was one of the first card sets I got too and I agree Shag, it was by far the best one. There were a few other sets that came close, but none were as memorable. I certainly can't remember my favorite cards from other sets. My kids have reviewed my binders and two of them love this set the best. My 4 year old daughter likes the Batman set better, but she's got a thing for Robin so it's understandable. Wow guys thanks for all the great comments we've got going on! Hope the others don't think I'm rude by addressing you first Joe, but like I say in the post I learnt to draw better off these cards - and I still get schooled each time a new piece of yours hits. The fact you did them under mass time pressure - well, that just makes the M.M '92 feat all the more amazing. Thanks again for dropping in and for posting comments here on IADW - the fact as a fan your heroes can comment on what you do is just more 'wow' than my early morning mind can handle at the moment, but you are welcome too at any time! Speaking of welcome - welcome to IADW Steeven, glad the Cap piece struck the same note with you! @Craig - yip you're right mate, I made this post pretty much right after your comments about 90's trading cards - so it's a draw. I didn't have much dinero back in those days so all the other sets (Fleer Ultra X-Men's etc) passed me by. But that was sweet with me, compared to my X-mad mates I still had the trump card(s) with this set! @ David See everyone is a Psylocke fan on the inside! I mean she's a ninja trained telepath - what's not to like? @Shag I was the reverse when this set came out. Due to distribution DC was sadly a rare find on our bookshelves, having died back to Batman and the odd Superman if you were lucky. The only places that really sold more than Marvel around me were trading card shops making the most of that genres boom. So I'd grab a pack of these and catch up on Hawkman, Adam Strange, and the Titans while I was there! Even now you can find Dark Horse in more shops here than you can DC. Joe Jusko himself frigin left a comment on your blog Dan! Dude, that practically makes you a celebrity. They really should have an issue of Wizard magazine that does an article about IADW. Mr. Jusko if your still reading these comments rest assured your work is worthy of all this praise. Aside from these cards I remember a piece you did of Vampirella that knocked it out of the park. In fact, on a IADW posting just less then two weeks ago I made a reference to Joe's work. Dan, you've gotten me back into comics, but there's no way I'm getting back into cards. ...I am pulling out the binders and looking over my old sets though. Thanks guys - I'm not sure IADW is Wizard material but appreciate the thoughts and both of your support! I'm just happy chuggin' away in my own little corner of the net for who ever drops by -human or inhuman I'm not fussy! It's always a pleasure to see this blog. And this post about the art of Joe Jusko is just fabulous. It's always great to see the art of a painter that I admire. Thanks for the great feedback João! Glad you loved the ten I picked out - it wasn't easy to narrow them down! This is really awesome stuff. I really had to fight the urge to dig out my cards along with my old Marvel Calendars. Thanks Darzia - glad to see you back at IADW! The only thing better than the cards is owning a few of the actual paintings all these years later. This set had some nice cards of characters you never really saw again in any of the other painted trading card sets such as Enchantress and how can this be the only set with Bullseye?! Other than Cap, other favorites include Hulk and Electro, and the similar Red Skull. A lot of the mid level characters and villains have the best images even over some of the heavy hitters such as Wolverine. Although Black Cat is great Joe did an even better painting of her for a poster in the 80's. Hey Mephisto, welcome to IADW!I think if I owned any original Jusko work I would die a happy man. You are right on the rarity of some characters too Darkhawk and the New Warriors being other great examples. I actually used to practise drawing the Red Skull one when I was teaching myself to draw, so I know what you mean!